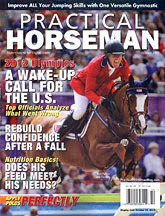 Head on over to get a free subscription to Practical Horseman from Free Biz Mag. It is completely free, and there are no automatic renewals. I've gotten several magazines from them over the years, and I've never paid a penny for any of them.